Six scientists (Drs. Steven Benner, Matthew Carrigan, Jamie Foster, Steven Gottesman, Katia Matcheva and Andrew Zimmerman) discussed the formation and evolution of life on Earth, in an open discussion held April 2, 2010 at UF’s New Physics Building. Four professors from UF’s Geological Sciences, Physics, Astronomy, and Microbiology & Cell Science Departments joined two scientists from the Foundation for Applied Molecular Evolution to consider: Life in the Universe? 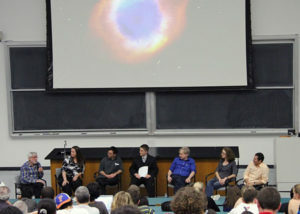 This event was hosted by UF’s Undergraduate Astrophysics Society. The objective was to create an intellectually engaging environment that both experts and beginners could enjoy. • How do we think habitable worlds form and evolve? • How might living systems emerge from these worlds?